For more than one hundred and thirty years, Bon Ami has prided itself on using simple ingredients to produce a high-quality cleaner that works. Since day one, we’ve used feldspar as the base abrasive mineral in our product. Once considered a waste material, feldspar was found to shine the shovels of quarry workers paid to separate it from silica quartz. Silica quartz-based cleaners scratch things clean, while softer feldspar-based Bon Ami polishes surfaces clean without scratching. Over the years, there has been pressure for Bon Ami to adapt to the marketplace with new additives and artificial fragrances to compete with mainstream cleaning products. When more and more chemical cleaning products were introduced in the 1970s, Bon Ami began receiving letters from consumers who thanked us for NOT adding chlorine bleach, perfume, and dye. We realized then that we had a community of people counting on our product, and it was our duty to serve them by continuing to say no to chemical additives. After all, our name is Bon Ami, which literally means “good friend” in French. Today, more and more people are turning away from harsh chemical cleaning products in an effort to reduce toxins in their homes. Certain chemicals used in popular cleaning products have been labeled hazardous. Bon Ami remains true to our name by continuing our promise to never use harsh chemicals. The little Bon Ami chick has been a part of our packaging and advertising since the late 1800s. A just-hatched chick became the perfect symbol for gentle Bon Ami because baby chicks don’t scratch for food like older chickens do. Today’s city dwellers no longer make this barnyard connection between non-scratching Bon Ami and non-scratching chicks but the chick remains a popular mascot. And we wanted to show that, despite our mineral ingredients and powdered form, Bon Ami is still a gentle cleaner and won’t scratch countertops or fine hard surfaces. 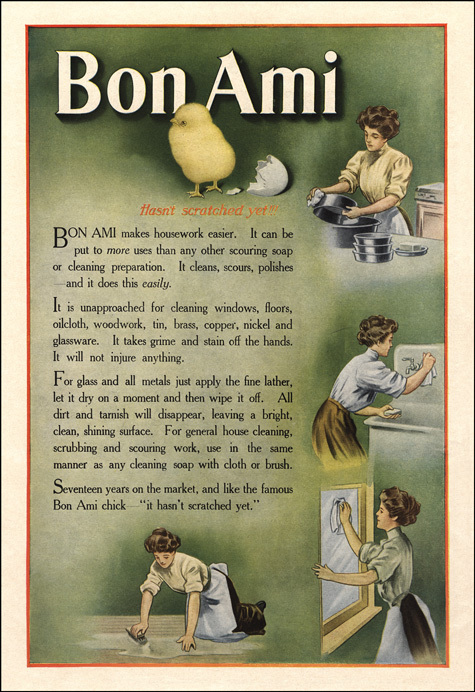 The name Bon Ami® and the Bon Ami chick with its accompanying “Hasn’t Scratched Yet!”® slogan are some of America’s oldest registered trademarks.